Iconic sportswear brand adidas Originals is launching its first global music event series featuring some of the most popular electronic music acts like Dada Life and AraabMuzik to play in select adidas Originals Stores across the world. In a global event series, adidas Originals will host exclusive live in-store performances in metropolitan cities, which will be live streamed from the respective adidas Originals stores. First confirmed gigs will take place in Paris and Berlin with other shows rolling out globally throughout 2012. 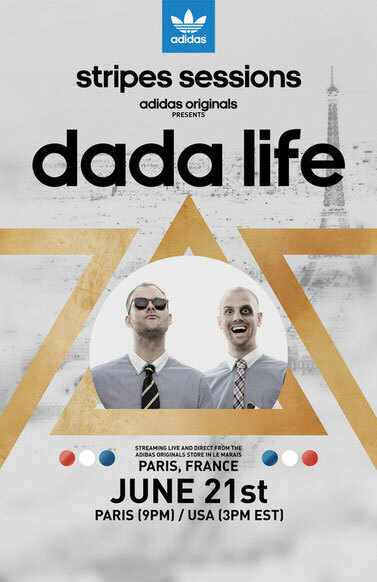 Kicking off the Stripes Sessions will be a one-hour set by Swedish electro-house duo, Dada Life, tonight in Paris at 9PM (CEST).